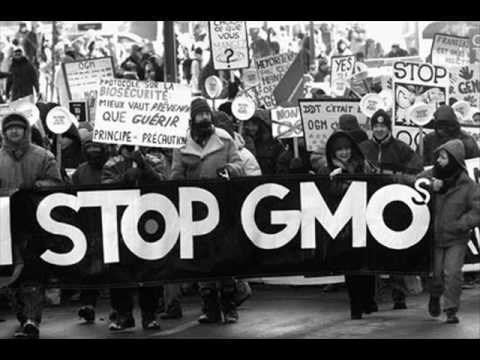 Genetically modified foods (or GM foods) are foods derived from genetically modified organisms. Genetically modified organisms have had specific changes introduced into their DNA by genetic engineering techniques. These techniques are much more precise than mutagenesis (mutation breeding) where an organism is exposed to radiation or chemicals to create a non-specific but stable change. Other techniques by which humans modify food organisms include selective breeding; plant breeding, and animal breeding, and somaclonal variation. GM foods were first put on the market in the early 1990s. Typically, genetically modified foods are transgenic plant products: soybean, corn, canola, and cotton seed oil. Animal products have also been developed, although as of July 2010 none are currently on the market. In 2006 a pig was controversially engineered to produce omega-3 fatty acids through the expression of a roundworm gene. Researchers have also developed a genetically-modified breed of pigs that are able to absorb plant phosphorus more efficiently, and as a consequence the phosphorus content of their manure is reduced by as much as 60%. If this shocks you, a new USDA-funded survey shows you’re not alone. Researchers from the Food Policy Institute at Rutgers’ Cook College found that only 52% of Americans realized that genetically modified foods are sold in grocery stores and only 26% believed that they have ever eaten genetically modified foods — a modest 6% increase since 2001. But what exactly is genetically modified food? Is it safe to eat? Why isn’t it labeled in the U.S.? The European Union and the United States are boxing it out. The U.S. government’s position: Genetically engineered crops are safe, resist disease better, and can provide much-needed food in starving nations. The EU position: KEEP IT OUT!We prefer organic, which is much healthier. The risk of genetically modified foods to health and the environment outweigh the benefits. Only the multinational biotech companies will benefit, dominating the world food supply and squeezing out traditional farmers. US PLANS TO GIVE AFRICAN NATIONS GMO FOOD AID. So you might ask, what’s the big deal? The U.S. government wouldn’t allow a product on the market without strict testing and approval, right? It seems genetically modified foods are a bit of a scientific anomaly, a creature that U.S. regulation agencies aren’t quite sure how to efficiently manage. “Clearly I think the regulation system in the U.S. could be greatly improved,” says Gregory Jaffe, director of the Biotechnology Project at the Center for Science in the Public Interest, a nonprofit, public advocacy group that supports the use of this biotechnology. But he says a CSPI study released in January 2003 showed that biotech companies don’t always voluntarily comply with federal requirements. Monsanto states that genetically modified foods are “more thoroughly tested than any other food on the grocer’s shelves to date” and “there have been no adverse effects documented from food produced from biotech crops.” Among industry supporters of this technology are heavy hitters such as the American Medical Association. One immediate health concern with eating genetically modified foods is allergens. Opponents point to an incident involving Starlink modified corn. In 2000, StarLink (approved by the EPA for animal feed in 1998 but not for human consumption because of concerns it contained a protein that could cause dangerous allergic reactions) turned up in many Kraft products, including their Taco Bell corn shells. Some corn crops were accidentally contaminated with the StarLink seed. Several people reported severe allergic reactions, and major recalls resulted. In the end, the EPA said federal tests didn’t conclude that genetically modified corn causes allergies, nor did they eliminate the possibility that it could not cause such a reaction. Archer’s group continues to press Kraft — the leading U.S. food supplier — to stop using genetically modified ingredients in their products, hoping if it does, the move will have a domino effect on other food suppliers. Currently, food companies aren’t required by law to label foods containing genetically modified ingredients, so it’s no surprise that most Americans don’t know they’ve eaten them. “I think consumers need to have info about the foods they’re consuming. … I think that if these products are so great, then why are there no labels? Why can people not know that [genetically modified ingredients] are in their food?” Archer tells WebMD. Jaffe agrees that people should have the right to know. However, he says he thinks that genetically modified foods are safe and labeling isn’t an issue as far as that is concerned. One reason food companies may shy away from labeling genetically modified food is the possibility of consumer rejection. Public opposition has had some effect, as seen in Europe, where the EU has banned genetically modified foods despite the U.S.’ wishes. American companies have vowed not to sell products made with genetically modified ingredients there, yet some of the same companies continue to sell them in the U.S., Archer says. “There are quite a few companies out there that have made this transition. Frito-Lay, for example, is sourcing non-GM ingredients, Gerber baby food is also sourcing non-GM ingredients, [and] there are many others that are listed on our web site,” Archer says.